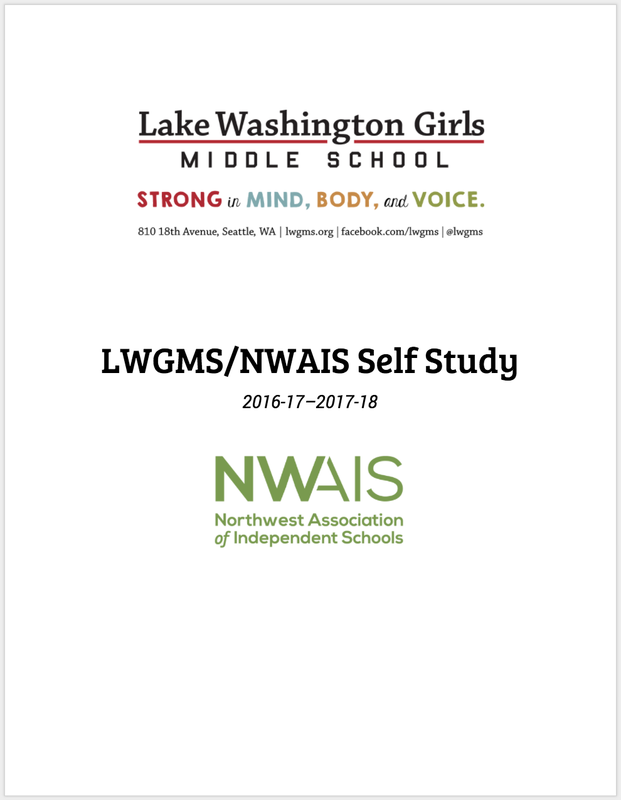 As a fully accredited member of NWAIS, Lake Washington Girls Middle School has undergone a rigorous eight year cycle of Self Study process and review. It's a process that both holds us to the highest standards of conduct and operations, and asks us to reflect upon our school-wide practices around teaching and learning, culture, leadership and management. Lake Washington Girls Middle School last hosted an accreditation team in March of 2009. LWGMS's Self Study: 106 pages strong! On Sunday, March 25, 2018, we will begin the next stage in our accreditation journey – hosting a visiting team. A team chaired by Dr. Jayasri Ghosh, Head of The Brightwater Waldorf School and comprised of other school heads and staff from peer schools will be arriving to offer their perspective on our school. They have received a copy of our Self Study and will be on campus for three and a half days. The team’s task is to see if what we have written in our Self Study accurately reflects what is happening at our school. The team will also be looking at whether what we do meets the NWAIS Standards for accreditation. While the team is here, members will be observing the overall school program and meeting with various groups with these two goals in mind. It is important to note that team members are not evaluating individuals. Even after the accreditation decision has been reached, we will still have work ahead of us as the NWAIS Annual Report requires that schools report back on their progress in addressing the major recommendations from the report. Additionally, three years after the visit, we will submit a Response Report addressing all recommendations. As NWAIS explains, “accreditation uses peer review to promote quality without standardization, ensuring each school remains true to its values while delivering a high-quality educational experience.” The eight-year process holds our school accountable, offers us an opportunity to gather and reflect, and offers parents and alumnae the confidence that Lake Washington Girls Middle School is a valuable institution true to our mission and values.